First off — congratulations on your engagement! This is such an exciting time of your life and I’m sure you’re thrilled to get started planning, if you haven’t already! Being married myself for the past four years, I can tell that you that it’s wonderful to have someone by your side. However, the process of getting married and not knowing what to expect in the coming years can also be stressful, overwhelming, and a difficult journey. As a life coach, I want to invite you to join my Ready-Set-Wedding program. 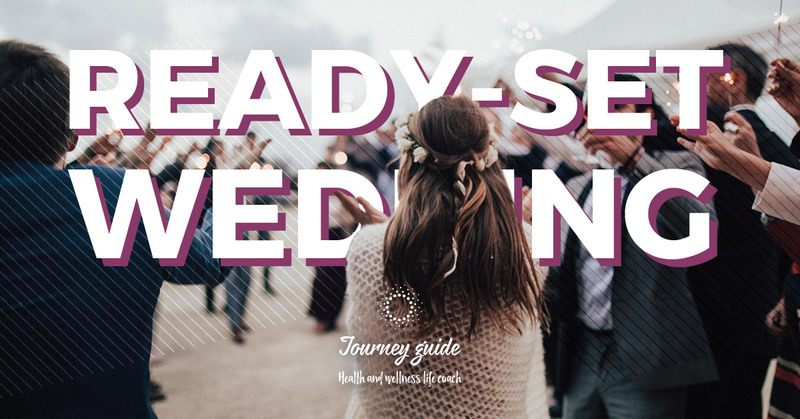 What is the Ready-Set-Wedding Program? This program will allow you to get a unique perspective on this time of your life, one that is supportive and free of all judgment. You will have someone on your side who will listen to your concerns and can offer an objective opinion. During the months of planning a wedding, there will be countless decisions to make, you’ll be asked dozens of questions, and you’ll even have to ask yourself some life-changing questions. Friends want to have their input on colors, location, and food; family wants to offer suggestions on how to lead your life as a newly married man or woman. I will be there so you can vent about things not going as planned or tell someone honestly that you’re scared. When things are at their hardest, I have developed strategic questions and exercises that we can use to guide you through this time and help manage the stress. If you want to lose weight or start living a more healthy lifestyle so you can present a more beautiful self on your wedding day, I can help! As a certified health coach, I can offer advice on the best foods to eat, how to balance workouts while also scheduling time for cake tastings. By the time your wedding and honeymoon come, you will have extra energy, you’ll feel and look great, and you’ll have the time of your life. As you’re planning your wedding, thinking about your future married life, and feeling the stress and pressure are building, I’ll be here to offer my undivided attention. Get in touch with me today if you want to learn more about my Ready-Set-Wedding program or if you’re ready to sign up!